It seems like just yesterday that I wrote about going back to school, but here we are, already at midterm week! My classes are going well, and the subject matter is most definitely something that holds my interest, which is a good sign. So far, my decision to not buy a parking pass seems sound, as I have yet to use the car to get to school (while I’m highly motivated to bike for its own sake, my decision is also reinforced by hearing my classmates complain about how hard it is to find a spot in the parking lot). Speaking of biking, I broke my streak after thirty-two days. It’s rather a shame, because other than the weekend of September 19-20, I have been on my bike almost every day. A couple of weeks ago, after a few shorter outings on Apple Jack, we (with G’s input) decided that he/his leg was ready to make the switch from passenger on Big Blue to pedaler on Apple Jack for the school commute. 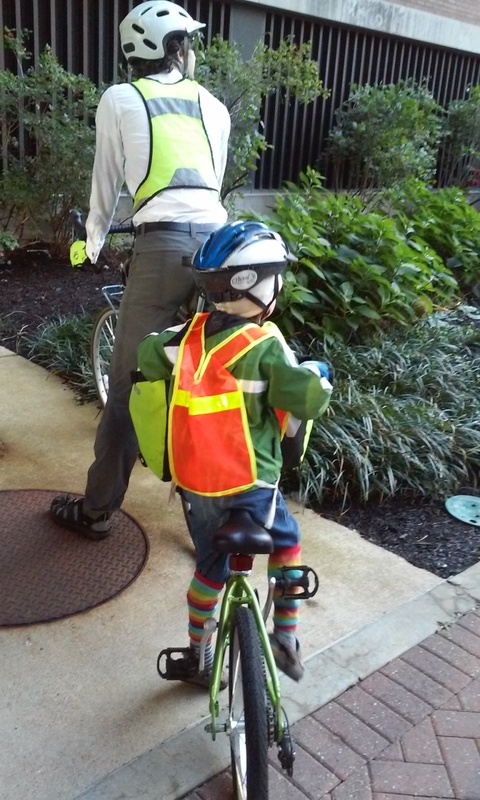 On Tuesday, I biked with Gabriel to school for the first time (Matthew has been super-bicycle dad for the past month). Since starting back to school the second week of September, G has made huge progress, from more confident walking to running (but not jogging — he is very clear that he doesn’t like to jog) and jumping. He still walks with a slight limp, but that is expected. The doctor was pleased with the progress, and everything looked good on the x-ray. We are tentatively scheduled to have the nails removed in early December. This entry was posted in Biking, Food and tagged school. Bookmark the permalink. Biking everywhere is so amazing, I’ve been doing it for years, and you get really used to it after a while. Beats searching for parking spots any day!